Istanbul is a city that is a must when stopping in Turkey, with it picturesque Bosphorus views, ancient bazaars and lavish palaces fit for a sultan. In this city that blends cultures and continents, it can be hard to narrow down what to add to your itinerary. Here’s some top places to visit in Istanbul, from century-old mosques to islands that make the perfect day trip. 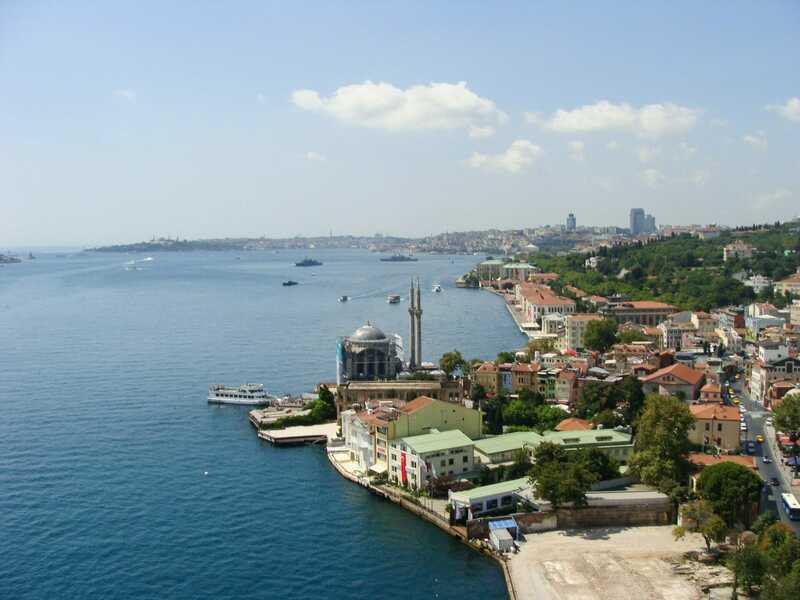 Istanbul is geographically unique because it sits upon both Europe and Asia, separated by the mighty Bosphorus strait. The Bosphorus is the cities lifeline and one of my absolutely favorite things to do is to take a ferry across it during sunset. The European side is home to all the main sights and the Asian side is more residential. Istanbul has a population of around 15 million and it can be felt especially during rush hour whether you are on the metro or sitting in traffic. Make sure to plan and give yourself plenty of time to get places. When planning to visit be wary of the Ramadan holiday (the last three days after Ramadan), where it will feel like the whole city is out and about. Istanbul is as safe as any major city, and it’s important to remain vigilant while traveling and be respectful of your surroundings as you would in any other destination. I have never personally felt unsafe traveling through any of the main neighborhoods, like Sultanahmet, where the Aya Sofya, Blue Mosque, and Basilical Cistern are. This church-turned mosque-turned-museum should not be missed for its stunning, innovative architectural beauty, and rich historical significance to the city. It’s a rare structure that showcases both elements of its use as a church as well as a mosque, from the mosaic of Christ from Byzantine times to the giant 19th-century medallions featuring gold Arabic letters from the Ottoman era. If you’re planning on visiting other popular sites like the Topkapi Palace, consider getting the Muzekart that allows you discounted entry to selected attractions around the city, including the Aya Sofya. Across the street from the Aya Sofya, this working mosque is another sight that should not be missed with its six minarets reaching high into the sky. The name of the mosque is apparent immediately when you enter the central prayer space where there are thousands of Blue İznik tiles. Visitors are allowed to only enter through a side door (look for the signs), since the main door is reserved for worshipers. Out of respect, make sure not to have bare shoulders or legs, and women need to cover their heads upon entering. This mysterious subterranean spot that has been made popular through film and literature, was in a past life a spacious water filtration system during Byzantine times that held up to 80,000 cubic meters of water. Be on the lookout for the white carp that make an appearance in the murky waters from time to time, and see if you can spot the upside down head of Medusa. The Basilica Cistern is walking distance from the Blue Mosque and Aya Sofya, and does not take long to walk through, depending on how crowded it is. This trio of archaeological museums: Archaelogy Museum, the Museum of the Ancient Orient and the Tiled Pavilion, houses collections from nearby Topkapi Palace. This is one of the oldest museums in Istanbul and holds an impressive collection of over a million items that includes the Alexander Sarcophagus, as well as Greek, Roman and Byzantine artifacts. The museums are located in the Eminönü district of the city, walking distance from Sultanahmet neighborhood. Give yourself 2-3 hours to see all three museums. Set aside at least half a day to see the grand Topkapi Palace, home to many lines of Sultans and their families. The separate Harem, where the Sultan’s wife and children lived is also worth experiencing and often less crowded since it requires an extra ticket. Fun fact: they still film popular Turkish period soap operas within the palace and you can often see the camera equipment scattered around the grounds and tucked into corners. Adjacent to Topkapi Palace is Gulhane Park, the city’s oldest park and is an ideal spot to wander around amid families and couple picnicking on the grass. Wander around one of the oldest and largest covered markets in the world, and get lost in the seemingly endless alleyways filled with ornate rugs, colorful lanterns, gold jewelry and pottery just to name a few things. You can spend at least a few hours haggling to your heart’s content over a cup of tea or just people-watching/window shop from afar. Since this is a popular tourist spot beware of exaggerated prices and fake items. Refuel with tea and sweets at one of the many tea shops around the marketplace. For a sensory experience unlike no other, this covered market overwhelms in the best way possible with its sights, smells and sounds. It’s a bit less crowded than the Grand Baazar, but still with the same lively atmosphere. The well-preserved Ottoman-era building is reason enough to pay a visit. There are Turkish delights, teas of every flavor, and an endless array of spices for edible souvenirs to bring home. The Spice Bazaar is walking distance from the Grand Bazaar. Stop by Kurukahveci Mehmet Efendi, a well-known coffee supplier in the city for a boost of energy. For stunning aerial views of the city and the Bosphorus, head to the top of this iconic medieval stone watchtower located in the Galata/Karaköy neighborhood. Built in 500 A.D., this tower was used to guard the city against invaders coming through the Bosphorous Strait. There are two restaurants on-site, where you can have a full meal or dessert and coffee with a view. The surrounding neighborhood is also great for wandering around the historical streets. Go early in the morning to avoid a long line. If you’re in the neighborhood at night, check out the tower lit-up at night. One of the main boulevards in the city, this lively street in the Beyoğlu neighborhood has everything from day time shopping to an active nightlife scene with numerous bars and clubs. Take a ride on the historic tram that goes the length of the street. If you are there at night, make sure to indulge in a popular late night snack: the islak burger, which translates to wet burger andis bathed in buttery tomato sauce. Make sure to stop by the Cicek Pasaji (Flower Passage), which is a historical building filled with cafe, restaurants, and wine shops. If you have a full day to get away from the city, this island escape is an excellent choice. The Prince Island are made up of nine different islands, but only four are open to the public: Büyükada (the biggest and most popular) Burgazada, Heybeliada and Kınalıada. Cars are not allowed on the islands (the main mode of transportation is horse-drawn carriages and bicycles) and it feels like you are going back in time with all the beautiful Victorian houses. The only way to get to the islands is by ferry, where a faster one will take you in 55 minutes versus a regular one that can take around 100 minutes for half the price (5TL). It’s best to stay in a central neighborhood like Sultanahmet, where you have easy access to sights like the Blue Mosque, Hagia Sophia, and the Basilica Cistern. Depending on the exchange rate between your country, 4-and-5 star hotels are a bit cheaper than places like the U.S. and Europe. An excellent budget option that is centrally located and is a 5-minute walk from the Blue Mosque and Hagia Sophia. The hostel is great for solo travelers, and is spotless and recently renovated. The best part is the rooftop terrace where you can relax with an ice cold Efes and take in the panoramic city views below. Breakfast included. This hospitable 4-star hotel is centrally located in Sultanahmet, and walking distance to top sights like the Hagia Sophia, Blue Mosque, and Grand Bazaar. Amenities include an on-site restaurant and bar, as well as a rooftop terrace where you can enjoy a glass of wine with a view. Airport shuttles are available. Located near the Galata Tower, this stunning luxury hotel feels like you have time-traveled backward. Most importantly the staff make you feel instantly at home. On property there’s a restaurant and bar, as well as an indoor pool and health club. Each room comes with a private terrace where you can put your feet up after a long day of sightseeing. Where are your favorite places to go in Istanbul?